B.B. Cronin joins us today for the book trailer reveal of his brand new picture book, The Lost Picnic! Watch the video below, then keep reading to learn more about the inspiration behind the story. CAN YOU TELL US A LITTLE BIT ABOUT THE LOST PICNIC? 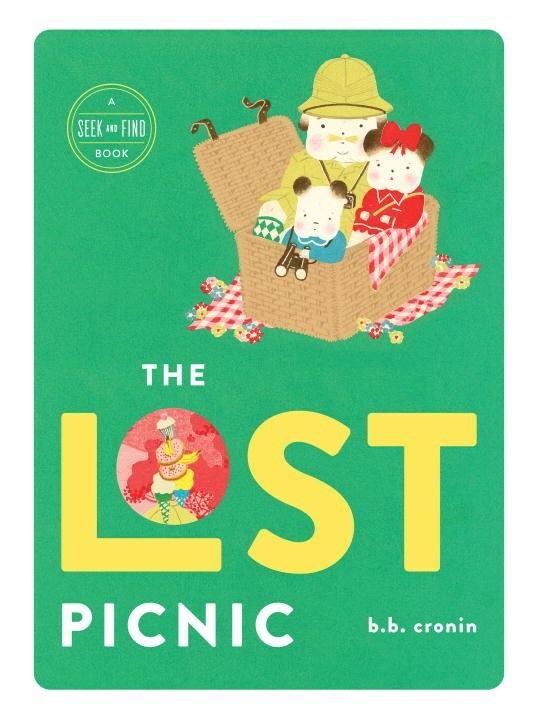 Brian: The Lost Picnic is my second book in a series, the first being The Lost House. The story is about Granddad and his two grandchildren going on a picnic. They tie the picnic basket to the roof of Granddad’s car, but along the journey, some items fall out. The reader needs to travel back through the various landscapes and find the missing items so the family can enjoy their picnic. WHERE DO YOU GET INSPIRATION FOR YOUR SEEK-AND-FIND BOOKS? Brian: The Lost House was loosely based on my own house where I grew up, in Dublin, Ireland. Granddad is also based (sort of) on my dad. Our house was a bed and breakfast, so there were lots of pieces of furniture and ornaments, pictures, clocks, etc. Both my parents loved collecting antiques of all sorts and styles, and this collection was spread out around the house. We would also change rooms to fit different needs or just for a change; for example, the living room would become the dining room and the other way around. We had some old-time long-term guests. One I remember was Mr. Green. He was always losing things—one day he flushed his wallet down the toilet by accident, but somehow my dad managed to retrieve it! I’m not sure how or that I even want to know. The house was very big and my dad spent lots of time on the roof fixing various leaks. At the time, I thought it was strange, but now, having my own home, I understand. The story of The Lost Picnic is loosely based on my Uncle Joe who had a car. Growing up, we didn’t have one, so whenever we went anywhere in Uncle Joe’s car, it was a real treat. His car was a Morris Minor and had these little flaps that would come out when he was turning left or right. I wish I had included them in the car in The Lost Picnic but I forgot that detail. WHICH SPREAD ARE YOU MOST EXCITED FOR READERS TO SEE? Brian: I have a few favorites. I especially like the formal garden scene where there is a lost piece of watermelon. For me, this scene is reminiscent of my local park in Dublin growing up, The Phoenix Park. I also really enjoy the highway scene where there is a missing banana, as it reminds me of parts of Brooklyn, where I now live. OF ALL THE LITTLE WORLDS YOU CREATED IN THIS BOOK, WHICH ONE WOULD YOU WANT TO BE LOST IN? Brian: The scene where they arrive at the picnic grounds. I love the feeling of light and fun with tents, campfires, boats, and the joy of arriving. 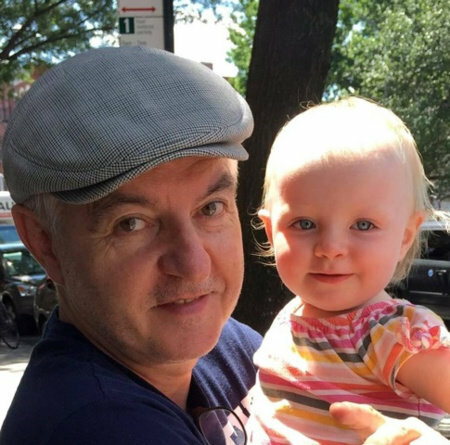 Brian: A bit of background about how I got started writing and illustrating children’s books: I had been an illustrator for major newspapers and magazines for close to thirty years with some years taken out to just paint. For the past ten years, I had started to paint more and not take on so many commissions. The paintings were for myself with no real direction of where to take this body of work. Then I started to imagine some of these works as stories, and this led to me exploring the possibility of writing a book. This change of direction was unexpected, but once I got started, I really felt that this was what I was supposed to be doing. Now I’m at the start of a new beginning. I love the idea of children looking at these images. It’s such a different audience for my work, yet the approach to my painting remains the same. I feel I can be really myself and not so concerned about style, just convey what comes naturally. I absolutely love making children’s books and hope to continue for many, many years. Thanks for sharing THE LOST PICNIC with us! The Lost Picnic will be on sale from Viking Books for Young Readers beginning September 19, 2017. B. B. Cronin is an award-winning illustrator originally from Dublin, Ireland and the author of The Lost House, which received the Gold Award from the Society of Illustrators. His work has appeared in The New Yorker, The New York Times, and on the covers of Penguin Classics, among many other publications. He was honored by a one-person show at the Irish Museum of Modern Art in Dublin in 1998. He lives and works in Brooklyn, New York with the illustrator Juliette Borda and their two children, Henry and Esmé. He divides his time between his kitchen, living room, and his studio.